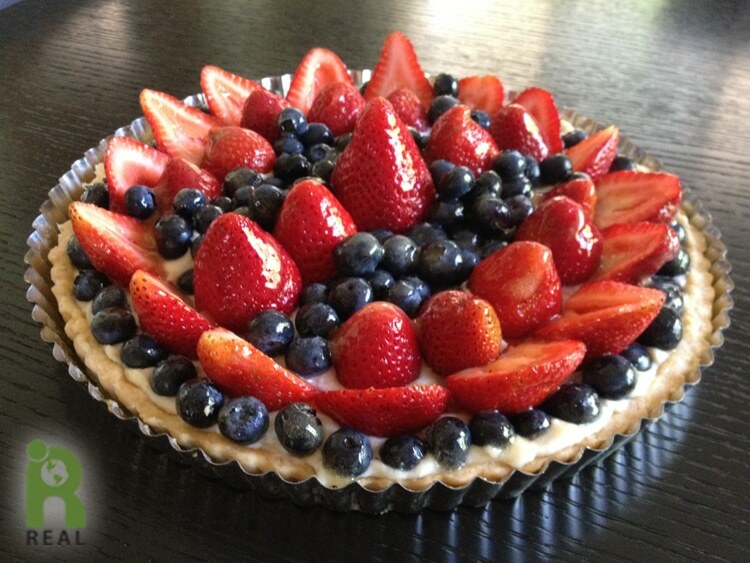 This Fresh Fruit Tart is a spectacular summer dessert for a picnic or barbecue. Dark chocolate lines the crust which is filled with a sweet vanilla custard and then topped with fresh fruit. Fresh fruit: Berries, Kiwi, Bananas. We used a pound each of Organic Strawberries and Organic Blueberries. Roll out pie crust and press into a 9-inch pan. Bake for 15 minutes. To keep the dough from bubbling while baking cover the dough with dried beans or use pie weights. Remove pie shell from oven. Remove beans or weights. Pour chocolate chips into pie shell. Spread around evenly. Bake for 5 minutes to melt the chips. Remove from oven. With a spactula or knife spread the softened chocolate out evenly to make a thin layer on top of the crust. Let cool. Rinse and drain cashews. Pour into a blender with water, sugar and vanilla. Blend until creamy. Pour into a saucepan. Sift starch into the cashew mixture and whisk to incorporate. Cook over medium heat, whisking continually until thickened. Remove from heat and allow to cool. Scoop the cooled custard into the pie shell and spread it around evenly. Decorate the top with fruit. Press the Apricot Preserves through a sieve with the back of a spoon. Brush the strained jelly over the top of the fruit.